If you wish to leave a prayer request, click on the words Novena to St. Martin de Porres in the Featured Post box at the top of the sidebar. personal or commercial use without written permission of the Artist). Most humble Martin de Porres, your burning charity embraced not only the poor and needy but even the animals of the field. For your splendid example of charity, we honour you and invoke your help. From your place in heaven, hear the requests of your needy brethren, so that, by imitating your virtues we may live contentedly in that state in which God has placed us. And carrying our cross with strength and courage, may we follow in the footsteps of our blessed Redeemer and his most sorrowful mother, so that at last we may reach the kingdom of heaven through the merits of our Lord Jesus Christ. Amen. St Martin imitated our Lord Who was meek and humble of heart. There was no pride or vanity in Martin, who realized that God is our Creator and that we are His creatures. Martin understood that God loves us as children and only wants us to be happy. So he had the wisdom to surrender entirely to the holy will of God. Let us imitate St Martin by humbly doing the will of God in all things. Prayer: St Martin, ask our Lord and his Blessed Mother to give us the grace of true humility that we may not become proud, but may be contented with the gifts that God gives us. Obtain for us the light of the Holy Spirit that we may understand, as you did that pride is an obstacle to union with God, and that true happiness comes only from doing the will of God. Amen. Recite one Our Father, ten Hail Marys, one Glory Be. 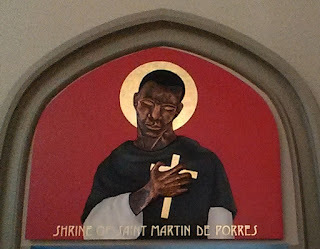 St Martin de Porres, pray for us. St Martin was entirely filled with the fire of God’s love. He knew that God sent His Son into the world to suffer and die on the cross for our sins. This thought stirred Martin’s heart with deep affection for so loving a Redeemer, and his whole life gave evidence of his sincere gratitude. May we, too, learn to love our Saviour more and more and show our love by our good works. Prayer: St Martin, why are our hearts so cold and lacking in love for the Son of God, who became a little child for our salvation? Why are we so slow to love Jesus, who loved us so much that he gave his life for us? Ask God and Our Lady of Sorrows to make us realize that the only way to happiness is by loving and serving God with our whole heart and soul. Amen. St Martin was called “The Father of the Poor.” He saw the poor, the sick, and the dying as children of God, and he helped them in a thousand practical ways. He studied medicine that he might know how to cure the sick. Every day he distributed alms to the poor. He built an orphanage for children. Let us imitate the charity of St Martin, that God may bless us as He blessed him. Prayer: St Martin, teach us to be generous with the gifts that God has given us. Make us sympathetic toward those who are suffering and afflicted. Pray to our Redeemer and to Our Lady of Mercy that we may always be kind and generous to our neighbours because they are the children of our heavenly Father. Amen. St Martin had a lively faith in all the teachings of the Catholic Church. He knew the Church was founded by Jesus Christ, the Son of God, Who came to teach us the way to the Father. God rewarded St Martin’s humble faith by enlightening his mind so that he could understand the mysteries of our holy religion. May God give us the grace always to believe the truths which he has revealed. Prayer: O St Martin, we need strong faith in God and His holy Church, especially in these days when religion is often considered unimportant. Bring all people to a knowledge and love of the true Church, that they may find the way of salvation and happiness. Ask Christ and Our Lady of Good Counsel to make us faithful disciples of Jesus Christ in life and in death. Amen. St Martin put all his trust in the goodness and promises of God. He hoped to obtain an eternal reward, through the grace of God and the merits of Jesus Christ. We know that St Martin’s trust in God was not in vain. We, too, are confident that God will forgive us our sins if we are truly sorry, and that he will give us everlasting life if we serve Him faithfully, by obeying His commandments. Prayer: St Martin, help us to have a great confidence in almighty God. Make us understand that He is one friend Who will never desert us. Keep us from foolishly presuming that we will be saved without doing our part, but keep us also from despair, which forgets the mercy of God. Ask Jesus and His Mother to increase in our hearts faith, hope and charity. Amen. St Martin kept his mind and heart always lifted up to the Creator of all things. His prayer came from the depths of his being, not just from his lips. He naturally turned to praise and thank God, and to ask Him for help. St Martin prayed with humility and perseverance, and God answered his prayers in miraculous ways. Martin will pray for us before the throne of God in heaven. Prayer: St Martin, help us to have great faith in Christ’s promise: “Ask and it will be given you; search and you will find; knock and the door will be opened for you” (Mt 7:7). Make us faithful in participating in Holy Mass and in devoting time to personal prayer every day, to obtain the blessings of God. Ask the Queen of the Most Holy Rosary to intercede for us too. Amen. St Martin was a hard worker who dedicated all his energies to his ministry. He did not seek an easy comfortable life. Even though he laboured so hard, he also imposed on himself severe penances for his sins and the salvation of others. If so holy a man did penances, how much more should we, who have seriously offended God by our sins! Prayer: St Martin, from you we learn how to be dedicated and unselfish. You teach us to avoid idleness and self-seeking. Give us some of that spirit of penance which you had, so that we may be constant in the struggle with temptation. Ask Jesus crucified and Mary, the Queen of Martyrs, to give us the grace to fight the good fight. Amen. St Martin died a holy and peaceful death. He had spent his life doing good as a humble brother of the Dominican Order. But whoever humbles himself shall be exalted. 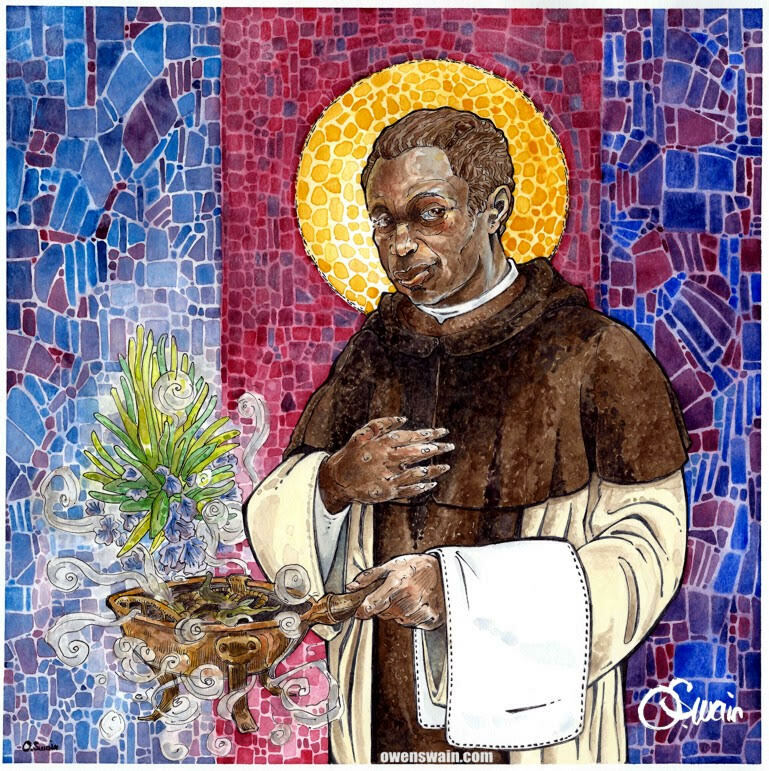 Soon his heroic life became known all over the world, and on 6 May 1962 Pope John XXIII solemnly proclaimed him St Martin de Porres. Let us rejoice that we have such a powerful intercessor among the saints of God! Prayer: St Martin, you have been raised up by God to how us the way to our true home. You have given us the good example and the encouragement that we need. We now realize from your life that all we have to do to win the reward of glory is to love and serve the best of Masters. May we ever be humble that we, too, may be exalted unto everlasting life. Amen. St Martin performed many miracles during his life and after his holy death. We can go to him with confidence for he will obtain our petitions if they are for our true welfare. His great heart loves to help us in every way. We have only to tell him our troubles and to ask him to help us. If we do our part, we can be sure that our friend St Martin will do his part. Prayer: Lord Jesus Christ, Who inflamed the heart of St Martin with an ardent love of the poor and who taught him the wisdom of always surrendering to God’s holy will, grant that, like him, we may be ever truly humble of heart and full of Christ-like charity for suffering humanity. Amen.